Spaceworks accepts award for “Downtown Revitalization”!!! From left: David Schroedel, Metropolitan Development Director at the Tacoma-Pierce County Chamber. Amy McBride, Arts Administrator at the City of Tacoma. Heather Joy, Spaceworks Manager. Gabriel Brown, Spaceworks Assistant. The Landmarks Preservation Commission has a lot to celebrate. This past year they helped pass a “Demolition by Neglect” Ordinance allowing for a more proactive intervention by the city on neglected historic buildings, plus they established an Emergency Preservation Fund which sets aside money to help prevent structure deterioration. This upcoming year will also see many exciting events and developments. In May alone, the Commission is involved in numerous events, some of which include: Tacoma’s first “Tweed Ride” on Saturday, May 10, and a historical presentation on Tacoma’s Whiskey Row by Micheal Sullivan from Artifacts Consulting on May 31st. 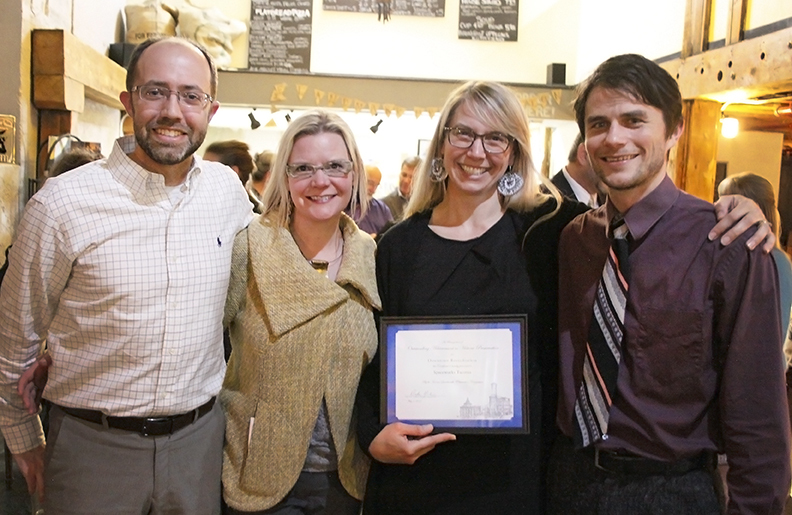 Last night, the Landmarks Preservation Commission hosted their annual award ceremony at B Sharp Coffee House in Opera Alley. 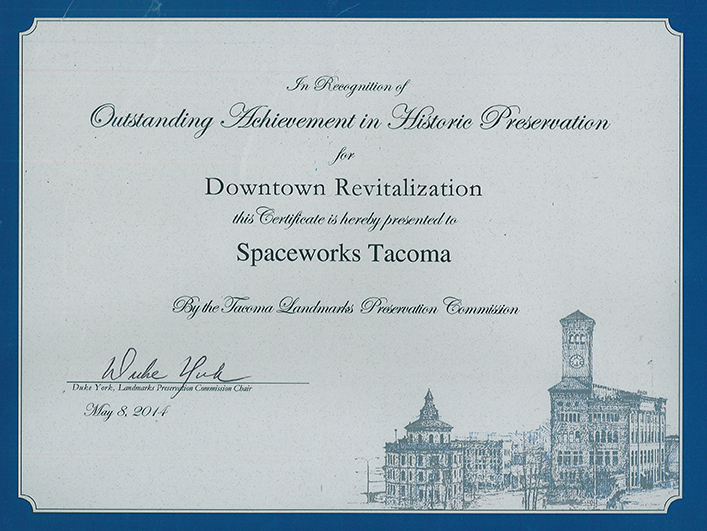 Spaceworks was recognized with an award for “Downtown Revitalization” and we can’t begin to tell you how honored we are. Matching entrepreneurs and artists with vacant spaces (a majority of which are in old buildings in downtown Tacoma), has been an incredibly rewarding and exciting process. It is difficult to quantify the true impact of the activities, and connections that have coalesced through this program. Spaceworks has partnered with 18 property owners, activated over 30 spaces in downtown, exhibited 84 storefront art installations, plus 80% of the businesses that were offered space and training through the program have transitioned into lease paying tenants! We have huge dreams, and plans for Spaceworks to take this dynamic approach to the next level. So, here’s a big THANK YOU to the Tacoma-Pierce County Chamber, the City of Tacoma, the Spaceworks Steering Committee, our Community Partners, our partnering property owners, and most importantly all the participant artists and entrepreneurs. They have put in the blood, sweat, and tears to make Spaceworks the growing and impactful program that it is today!